As Palm Beach County’s coastal ridge areas were being developed in the early 1900s, land speculators eyed the lands just beyond, along the pine ridge that started about where Military Trail is today. The land between today’s I-95 and Military Trail needed quite a bit of drainage, through the chain of lakes that runs from Lake Mangonia all the way south to Lake Ida in Delray Beach. This buffer area was quite swampy. The “Flatwoods” or pine ridge that runs from Military Trail to 441 was a little higher. The Palm Beach Farms Company bought thousands of acres of this land, and offered it up for sale in five acre (and larger) tracts. The company platted the Town of Lake Worth in the process, to offer a “free” 25 foot town lot if you bought acreage out west. Greenwood and Bryant owned the vast holdings, depicted as the shaded areas on this map – each square is 640 acres. They had many takers for the land, yet much of it was not drained for many years, and was wet during the summer rainy season. Many acres end up in farming and dairying, and today of course it is mostly covered with housing and business developments. The sales literature was filled with glowing reports, and quite frankly, some real untruths, such as this quote: “So dry is the air with an easterly wind that within a quarter mile from the sea a wet garment hung out in the breeze at night will be found quite dry in the morning.” Somehow Florida humidity and mosquitoes did not exist for the sales writer. They were unwelcome surprises for those early land purchasers. 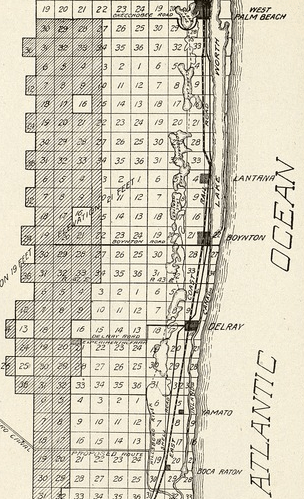 In the process the company built Boynton Road and Delray Road – today’s Boynton Beach Boulevard and Atlantic Avenue as ways west out to the land. Cars and trucks allowed farmers access to the land, although the shell rock roads were slow going. The land boom was on. 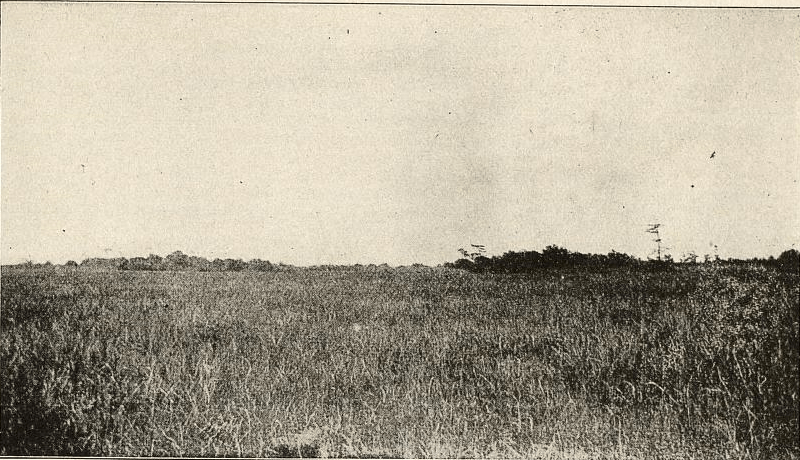 The wilderness as seen in 1910. Tagged boynton, Dairy, Greenwood and Bryant, Lake Worth, Military Trail, Palm Beach Farms Company. Bookmark the permalink.